I was struggling to find a topic for my blog this week, I decided to go through some of my old pieces of writing, and I found a poem that is extremely personal. It’s safe to say that putting this poem out in the world is risky. Will people think I’m exaggerating? Probably. Will they think that I wrote things I don’t actually mean? Maybe. But is this how I feel some of the time? Definitely. This poem named, “Imprisoned” pulls some of my greatest insecurities that have manifested in the inner workings of my brain and spills it into words. That I’m good enough the way I was born, the way that I grew? Now I’ll be the first to admit, that piece of writing is pretty harsh, and honestly, that day I was probably being a typical, stubborn, woe-is-me teenager. Putting that aside, however, there is definitely truth behind all the words that I formed into that rhyme scheme, and the way I felt that day probably heightened what I believed to be my truth. That day, I truly hated how dark my eyes are and how pale my skin is and how I am never going to be extremely skinny. That day, I truly hated seeing people on Instagram, who I believed would forever be what society viewed as “prettier” than I am. That day, I truly hated the fact that all I could ever think about was how I looked, and how I’ll never be “perfect.” I could not even tell you what I thought “perfect” was that day, because really what is “perfection”? It has been months since the day I spilled that poem onto paper, but something about the fact that I was so critical of myself, almost scares me. It’s scary to think that I was able to pick myself apart like that. I have realized, however, that being insecure and picking yourself apart is not a new thing. The human race has continually been susceptible to beauty standards literally since the River Valley Civilizations and possibly even before then. Whether it was women breaking their feet in China, or women trying to “tighten” their figures in the 19th century with corsets, people have constantly been “imprisoned” by these forever changing ideas of beauty. Being insecure and wanting to be accepted for superficial beauty should not be a trend, and I do not understand why it became one in the first place. Of course, we all have things we wish we could change about how we look, and of course, those things will always be in the back of our minds. However, I think as a human race, we need to not only be more accepting of the people around us, but more accepting of ourselves. We need to be more accepting of every part of ourselves because although it sounds corny, we are all truly beautiful in our own ways. Whether it be your eye color, or your height, or your smile, or laugh, or your beauty marks, everything makes up what is wonderfully, truly, and naturally you. I am not saying that every single day we need to wake up and say, “Self, you look absolutely stunning today.”, because I know that there are definitely days where I look like a literal mess and a half. However, what I am saying is be confident in all parts of you. Like yeah, maybe my oversized sweatshirt and messy hair pulled into a scrunchie isn’t “great looking” per se, but I’m sure as heck gonna rock it. Accepting all parts of yourself is not just focusing on your looks, but also your own quirky personality, who you are as a person, and what you do for the people around you. Once we stop comparing our own messy days with someone else’s “Wow I actually look so good today,” days; and once we stop perceiving our lack of other people’s characteristics as our “flaws”, the world will be a much more enjoyable place. So please, be the confidently, wonderfully and uniquely you. Be the YOU, you were born to be, and appreciate others around you for being radiantly themselves. Anastasia Meininger, aka “Offbeat Rhythms”, is a high school student in Westchester County, a suburb of New York City. 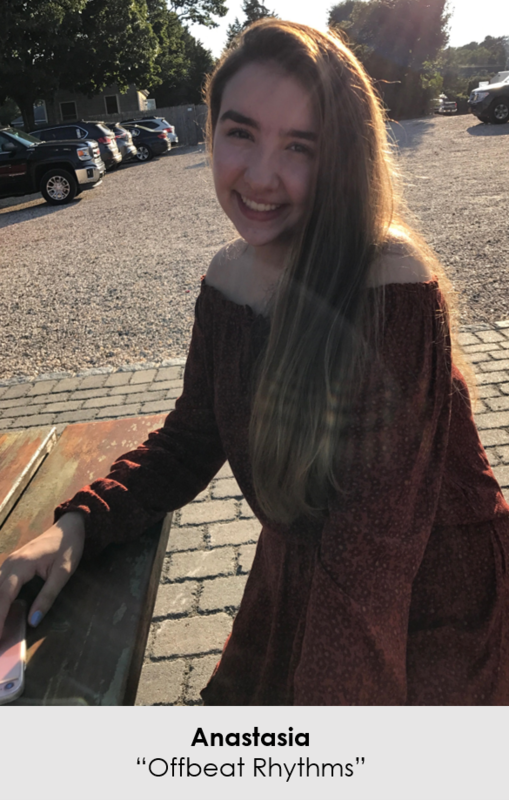 She lives with her parents and older brother, and her life is filled with her hilarious and loving Italian, Irish, Greek, and German family, as well as her wonderfully crazy, and diverse group of friends. 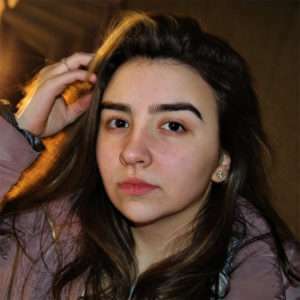 Anastasia is a normal, yet distinctly unique teenager who loves performing, making people laugh, and even going to school! Her favorite subject is Science, especially Chemistry, and when she’s not studying, you can find her at her dance studio, where she rehearses for her dance competitions, and vocal showcases.